Ronia Hutchinson of Salon Oasis in Boca Raton, Fla., explains how she does these clean-cut backfill lines, using a little otherworldly help from a “UFO” bit. E-files are the workhorses of nail salons. 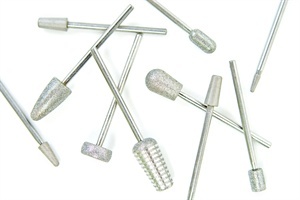 Techs put them through rigorous daily schedules to keep appointment books well-packed, and though manufacturer maintenance is a must, here’s how you can keep yours preserved in the salon and humming over nails year after year. Choosing new bits can be such a confusing and overwhelming decision when first starting out because we have so many choices. You need to give your drill some TLC if you want it to last a long time — and do its job properly. Keeping it clean and dust-free are the first steps to keeping an electric file in good condition.